Creative misuse starts in preschool! 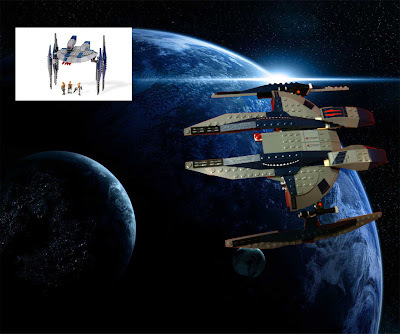 Lego Hacker hacked this diminutive Republic Walker from the Star Wars universe into a Klingon battlecruiser from Star Trek. 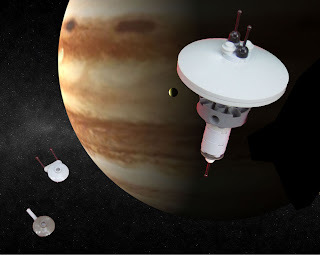 The background image is from NASA. Lego Hacker turned the Star Wars hyena droid into a Dominion battlecruiser from the Star Trek universe. 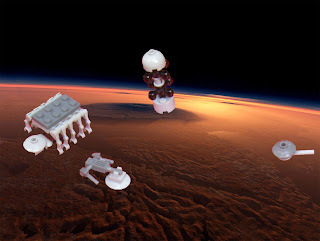 Again, Lego Hacker's sister chose the background (I'm afraid we don't know how to give the artist credit). Lego Hacker has begun transforming Star Wars Lego sets into Star Trek ships. 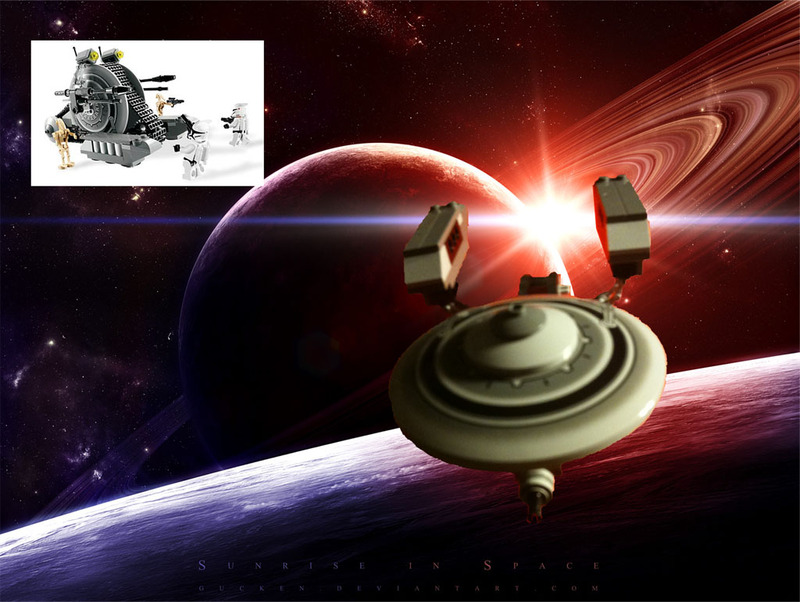 Here a Corporate Alliance tank droid from Star Wars becomes a Federation starship from Star Trek. The background image, chosen by Lego Hacker's sister, is by Gucken. 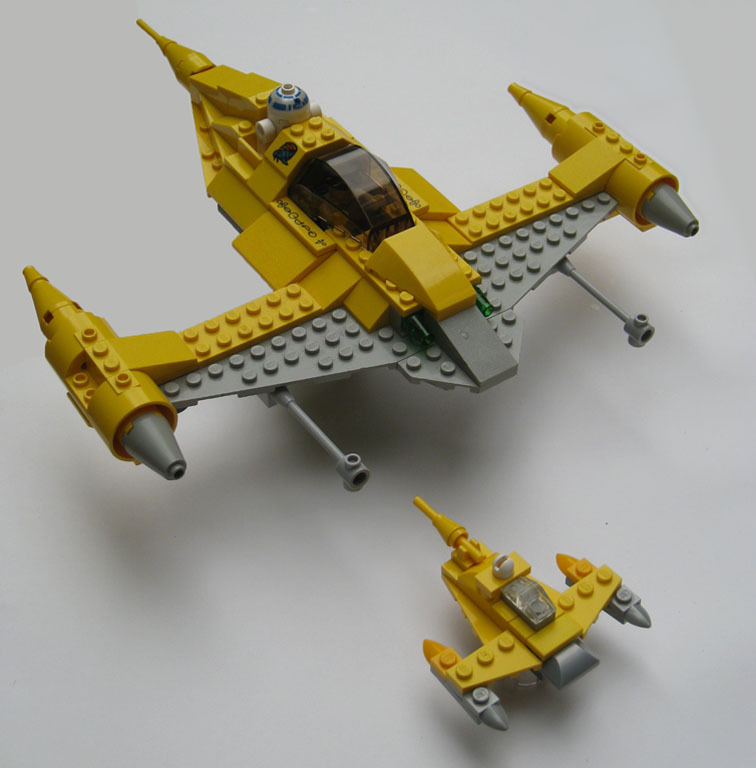 The Lego company sells a standard-scale Naboo fighter from the Phantom Menace movie, shown here (in a slightly modified variant that Lego Hacker thought was more accurate to the movie). 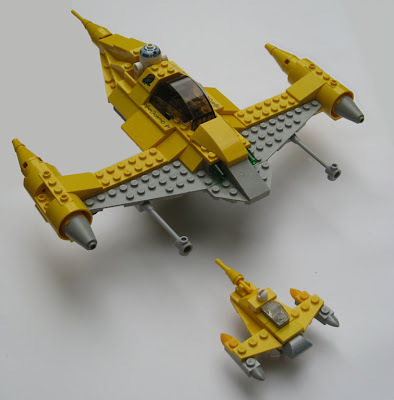 The miniature Naboo fighter pictured next to it illustrates the design problem of trying to capture the essence of a form with the fewest possible bricks. 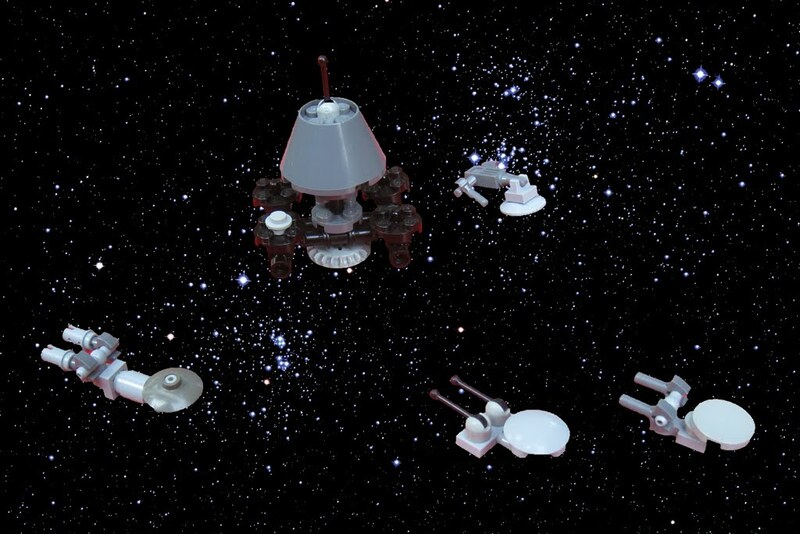 Here are Lego Hacker's "micro" versions of some of Star Trek's most notorious bad guys. 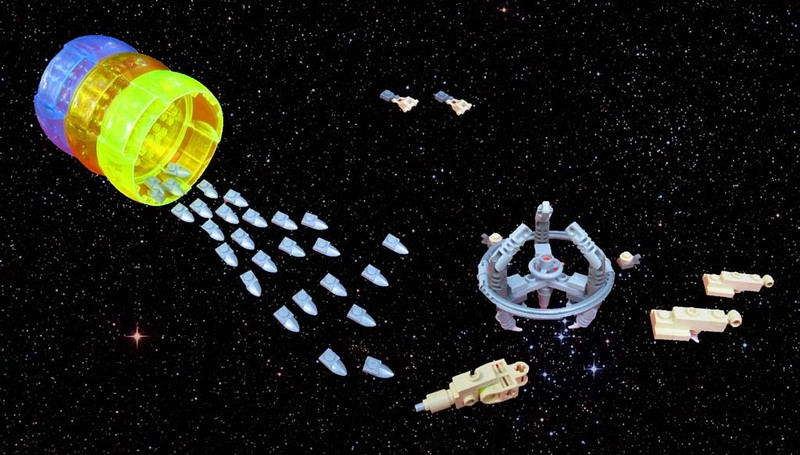 In one image, a Klingon Bird of Prey circles the Ty'Gokor orbital station. In another, a slew of Jem'Hadar warships emerges from the wormhole outside the starbase known as Deep Space Nine / Terok Nor, while Cardassian Galor and Keldon class starships patrol nearby. The design constraint of conveying a structure's essence with a minimum number of bricks can inspire inventive ways to re-use Lego pieces. 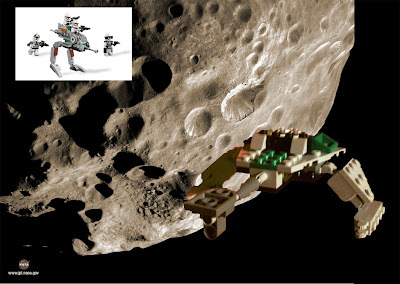 For example, Lego Hacker bent two pieces from the bow of a Viking ballista to make the circular habitat ring of Deep Space Nine. 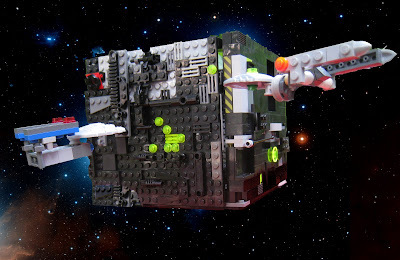 In these scenes of Federation starbases from the Star Trek universe, Lego Hacker set himself the challenge of conveying recognizable structures with the fewest possible bricks. Some of these "micros" are made with only three or four pieces. Shown here are Miranda, Freedom, Akira, Excelsior, and Constitution refit ships surrounding Starbase 357, Jupiter Station, and the Utopia Planitia shipyards above the Martian surface. 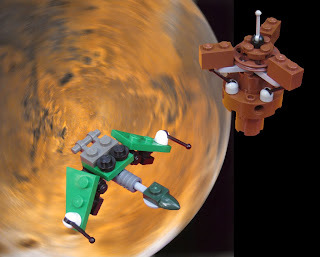 Here the challenge was to re-create familiar starships from the Lego universe at a small scale. In this view a Galaxy and Sovereign class face off against a Borg cube.